Whether or not you are going to attend Comic-Con in San Diego this year (I’m not attending the con), come join me and many others for not one, but two awesome events. First is the joint The Walking Dead Meet-Up party happening July 18th. Brought to you by two fabulous podcasts, The Walker Stalkers and my all-time fave, The Walking Dead’Cast, you can purchase tickets to this once in a lifetime event including a live podcast by both shows as well as various cast members (actors not yet confirmed or announced) from The Walking Dead. Tickets are still available, but moving quickly. Not only will you have the opportunity to meet with Jason (sadly Karen will not be able to attend), but you can sit back and watch as I drink myself into a stupor. Tickets for this event can be purchased here. 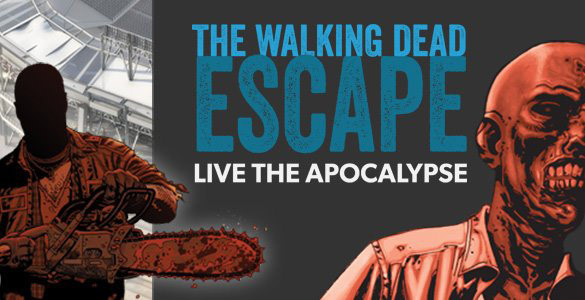 Next, I will be running The Walking Dead Escape at Petco Park on July 20th. Whether you run at the same time that I do or not, you shouldn’t miss what I understand to be a great time being either chased by the undead, or have the opportunity to be made up as a zombie and chase us hapless suckers running for our lives. I don’t think tickets will be available for much longer… so jump on it if you plan to attend. Purchase tickets here. I would love to meet up with some of my readers and listeners of The Walking Dead’Cast who have had to tolerate my presence from time to time. If you do plan on attending, don’t be shy… let me know, and don’t forget to say hello. Hell, I may even buy you a drink!